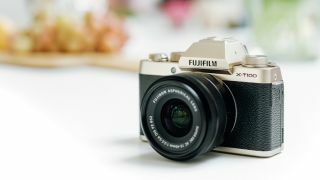 Fujifilm's X series has been one of the great mirrorless successes, with its fusion of classic style and up-to-date tech making the line stand out against those from rival manufacturers. The likes of the X-T2, X-Pro2 and flagship X-H1 have already persuaded many to trade in their DSLRs, but those not tied to any system who just want to crack their way into it at minimum cost have a handful of credible options too. Right now, the X-T100 is arguably the the most appealing one. Its main draw is the fact that it's a significant step over more junior models like the X-A5, with a smart design and a number of high-end specs, but all at an asking price that you'd expect to see attached to a far more basic DSLR setup. Top features include a 24MP APS-C sensor and an OLED electronic viewfinder with 2.36million dots, together with an LCD screen that boasts an innovative tilting mechanism. This allows it to either simply move up and down or all the way around to face the front. Fujifilm certainly has form with flexible LCDs, but we've not had this design on any other camera yet. You also get 4K video recording (albeit to 15p) and Fujifilm's Film Simulation modes, which allow you to treat images with effects that mimic the company's Velvia, Astia and Provia film emulsions among others. Furthermore, with the same X-series mount as all the pricier models in the stable, you can partner the X-T100 with everything from a basic pancake lens through to a beastly telephoto zoom. Other niceties you don't always find on the X-T100's competitors include a tough, anodised aluminium top plate and phase-detect AF for speedy focusing, as well as Bluetooth built right into the body. Even the 6fps burst mode makes it a credible choice for action. Need something a little more powerful? The company's X-T20 is the next step up, with the same basic idea but a smattering of extra X-series goodies. Dashing design and a peachy price tag. What's not to like?